We went to visit the wonderful Capreolus Fine Foods and were fortunate enough to be given a tour of the premises by Karen herself. Seeing all of the hard work and time which goes in to producing their products, from running a business to making sure the recipes are consistent, it made us appreciate what fantastic producers we have here on our doorstep. It all started in 2009. My husband David was the director of a Nano technology company but was unfortunately made redundant. 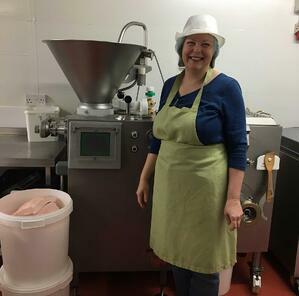 After putting every ounce of energy into securing a job including working as a labourer, we started to experiment with cured and smoked foods and decided to change what was originally a hobby, in to a business. We had lots of encouragement from friends and family and realised we needed the professional opinion of real chefs. We reached out to Tim Maddams, formerly from River Cottage and he was really impressed with our products, particularly the venison, which meant a great deal to us. We quickly realised that a grade II listed manor house was not the best place for the business, rented our house out and found this one on the Rampisham Estate. Its many outbuildings make it ideal for the business. We’ve put two PortaKabins into one of the barns to create the shell of the workplace, and we purchased some of what we needed to build specialist rooms from e-bay! We added a further PortaKabin outside that we use for a special condition maturing room. It has to be the Dorset Coppa. This is a wonderfully sweet and peppery meat made from the neck fillet of the pig, we dry cure it with pepper, coriander, juniper and mace, we then air dry it for a number of weeks. It is so versatile and absolutely delicious for breakfast. It also works well with asparagus or scallops. We’ve known Porter Dodson for many years and attend their Hot Topics events. As a small business, these events are tremendously helpful to us and supply us with information which we would otherwise either have trouble getting or have to pay for. They also invite us to events throughout the year which enable us to raise the profile of the business. Money is the main challenge for us, running a business is not the glamorous job that it seems and it certainly comes with its struggles. 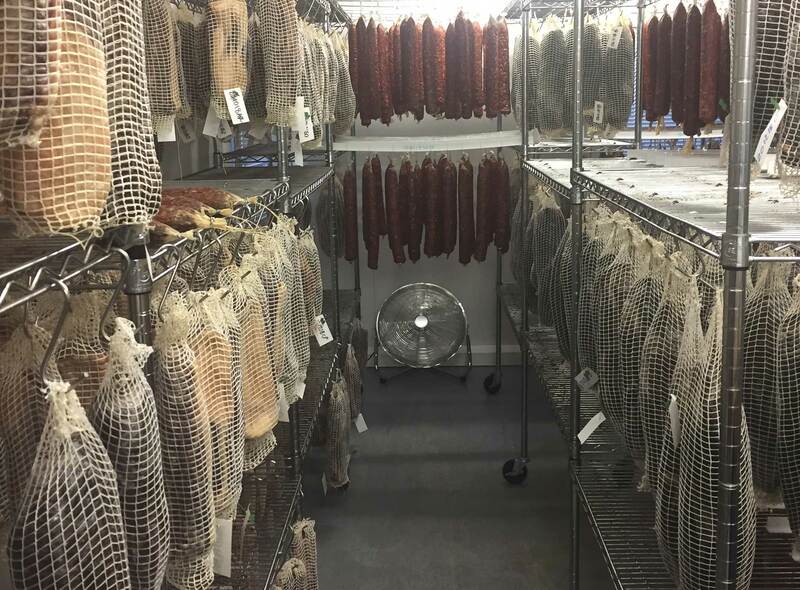 It is a challenge to maintain good levels of stock of some products as the curing and drying time for some items can take many months before they are ready for the customer. This is something we are trying to get ahead of. However, this hasn’t come in the way of success and we are very proud to supply a vast number of eateries including all 17 restaurants of The Stable pizza chain, we also supply Tom Kerridge at the Rugby International matches, Twickenham and The Ritz, to name a few. What’s the best thing about living in Dorset? It’s impossible to pick one thing. But you can’t beat the beautiful scenery, the views when driving up a hillside are spectacular and the silence at night time. I am fortunate enough to be able to say that the only thing I hear at night is the noise of wildlife. What makes Dorset so great is how happy the people are, we notice a considerable difference in the happiness of people when we visit London and feel fortunate to be around such cheerful people. We pride ourselves on being an employer of choice. We offer flexible working hours to accommodate our staff needs. One of our team lives across the road and works until the school bus arrives in the afternoon. Another of our team is a carer and sometimes needs to work different hours. Having your own business is a full time commitment. We’ve got better at setting aside time for ourselves and now only work five days a week, although they are often 12-15 hour days! PA to our Managing Partner, Ellie Watts particularly enjoyed the Dorset Soft Spreadable Salami, here is what she said: "I've not tasted a spreadable salami before so I was intrigued to find out what the texture would be like. Spreading it on a piece of crusty white bread was absolutely delicious, you get the wonderful rich salami flavour with a similar texture of pate. I will definitely buy again!"